It often seemed that provoker was just another hyphenate on writer/director Sam Fuller’s resume. So, when one considers his last movie made in the US, “White Dog,” it’s not surprising it garnered the reaction it did. In fact, one could assume that Fuller was courting it. “White Dog,” is the story of Julie Sawyer, a young actress in Los Angeles. One night driving home, she hits and injured a large white dog with her car. She races to the vet with the dog in her car. The vet assures her the dog will recover just fine. She puts up ‘found dog’ notices around the neighborhood, but more and more, she finds herself liking and eventually loving the dog. But then he starts attacking people. Upset, Julie brings him to an animal trainer. It’s there that she learns the dog’s real purpose. It’s a white dog- a dog trained to attack black people on site. She is aghast that someone would do such a thing and wants to have the dog destroyed. However Keys, a black animal trainer, wants to rehabilitate the dog. He wants to show that if racism can be taught, it can also be un-taught. By the end of the movie, both Julie and Keys find out that perhaps it’s not as simple as they both originally thought. 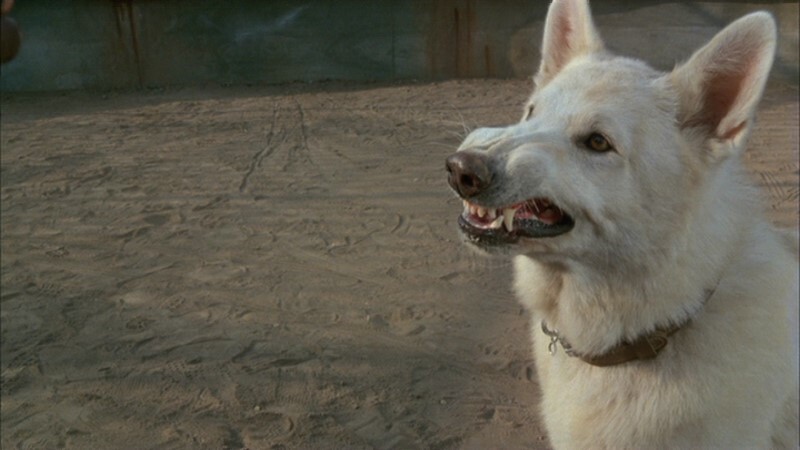 One can see, simply through the synopsis that “White Dog,” is the kind of movie you remember. Fuller, working with future director Curtis Hanson made the movie a taught, clean, 90 minute movie, with no spaces for things to hide in the shadows. The response to the movie’s release was wonder by critics, shock by audiences. The NAACP protested. People were upset by even the concept of the movie. Paramount decided, after distributing it abroad, that US audiences couldn’t handle, or didn’t want to handle the messages of the movie. It remained on the shelf for 25 years, whispered about by Fuller fanatics, forgotten by most everyone else. This is one to catch. Originally planned by Paramount to be ‘”Jaws” with paws,’ “White Dog,” goes above and beyond such a simplistic and easy plot summary. The movie is wonderfully blunt, to the point, and thought provoking. I’m quite excited for this release! Thanks for the review!